Ali Musjid camp from Sultan Tarra, showing sunga where Major Birch & Lieutenant Fitzgerald 27th Punjab Infantry, were killed. bl.uk > Online Gallery Home	> Online exhibitions	> Asia, Pacific and Africa Collections	> Ali Musjid camp from Sultan Tarra, showing sunga where Major Birch & Lieutenant Fitzgerald 27th Punjab Infantry, were killed. 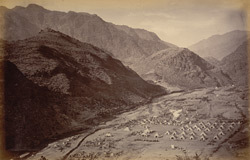 Photograph of a British Army camp in a valley in the Khyber Pass near Ali Masjid, taken by John Burke in 1878. Burke accompanied the Peshawar Valley Field Force, one of three British Anglo-Indian army columns deployed in the Second Afghan War (1878-80), despite being rejected for the role of official photographer. He financed his trip by advance sales of his photographs 'illustrating the advance from Attock to Jellalabad'. Coming to India as apothecary with the Royal Engineers, Burke turned professional photographer, in partnership at first with William Baker. Travelling widely in India, they were the main rivals to the better-known Bourne and Shepherd. Burke's two-year Afghan expedition produced an important visual document of the region where strategies of the Great Game were played out. Of the three columns moving simultaneously into three approaches into Afghanistan, the Peshawar Valley Field Force, led by Lt. General Samuel Browne, was the largest. Its aim was to take the fort of Ali Masjid and thus the Khyber Pass. General Browne's tactic in attacking the vital fortress described as the 'key to the Pass' was to split his force into a further three columns. One advanced up the Khyber Valley, and the other two went up the parallel Lashora valley to occupy the heights above and behind the fortress of Ali Masjid and launch their attacks. Brig. General F. Appleyard commanded the Third Infantry Brigade of the Peshawar Field Force, composed of troops of the 81st North Lancashire, 14th Sikhs and 27th Punjabis.